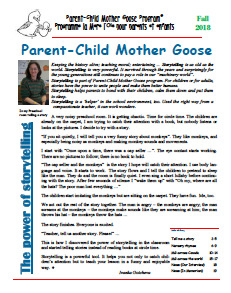 The fall issue of the Parent-Child Mother Goose newsletter is now available! For those of you who have requested new stories and rhymes, this latest issue of the National Parent-Child Mother Goose newsletter will be a real treat, full of new material. The newsletter is also a great way to catch up on what is happening with our programs in other countries and across Canada. Please send your comments, questions and ideas for items to include in future issues to Ivanka Gotcheva at ivgotcheva@sympatico.ca. 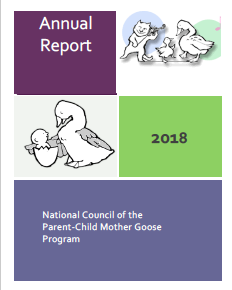 Interested in learning more about the activities of the National Council of the Parent-Child Mother Goose Program over the past year? Our Annual Report is essential reading! Check it out for reports on fundraising, membership, and key committees such as the Programs and Training Committee. Our sincere thanks to all those who volunteered their time over the past year to participate on committees and advisory groups, and to those who made donations to support our work. Your support of Mother Goose is deeply appreciated! 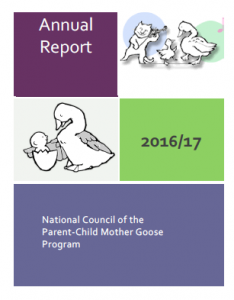 The National Parent-Child Mother Goose program will be holding its 2017 Annual General Meeting on November 28, at 3pm Eastern Standard Time. The meeting will be held via conference call, and all members are invited to join us to share what is happening in their program and community, and to hear from others around the country. The Annual General Meeting is a great opportunity to connect with other Mother Goose teachers and supporters. If you can’t join us, you can still stay up to date with the activities of the National Program, by reading our Annual Report. This entry was posted in Latest News on November 27, 2017 by marilee. The 2017 SCCC Conference ‘150 Golden Threads’ compliments Canada’s 150th birthday celebrations. This year, we’ll focus on what and how it was and is to build a nation. Please join us in this celebration of Canada, and of SC-CC’s 25th anniversary, in Edmonton, Alberta, May 22-28 2017. Registration opens January 9th 2017! Early Bird pricing (SC-CC members only) will be available from January 9th to February 6th, so register early! Head to the SCCCC website for more information. This entry was posted in Latest News on April 24, 2016 by marilee.